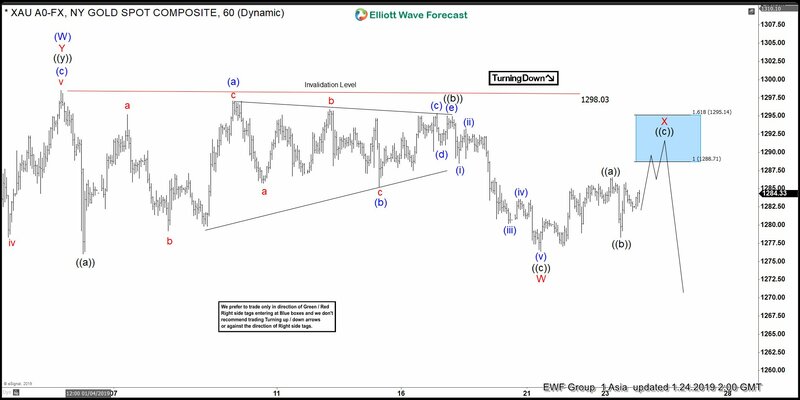 Short term Elliott Wave view in Gold suggests the rally to $1298.03 ended wave (W). The yellow metal is now correcting the cycle from August 16, 2018 low within wave (X) in 3, 7, or 11 swing. Internal of wave (X) is unfolding as a double three Elliott Wave structure where wave W ended at 1276.4 and wave X is in progress. A double three is a combination of two corrective Elliott Wave structures. The link of the two structures has the label of W and X. Internal of wave W in this case is a zigzag Elliott Wave structure. Wave ((a)) of W ended at $1276, wave ((b)) of W ended at $1294.52 and wave (©) of W ended at $1276.40. Wave X bounce is currently in progress to correct cycle from Jan 4, 2019 peak ($1298.03). The internal of wave X is unfolding as a zigzag. Wave ((a)) of X ended at $1286.53 and wave ((b)) of X ended at $1278.30. Expect Gold to extend higher in wave (©) of X towards $1288.7 – $1295.1 area before turning lower. As far as pivot at $1298.03 high stays intact, Gold can turn lower and continue to consolidate.